Thomas Gainsborough (Thomas Gainsborough, baptized on May 14, 1727, Sudbury, Suffolk County — August 2, 1788, London) — painter and engraver, one of the most prominent and versatile English artists of the XVIII century. Famous for its exquisite portraits and idyllic landscapes that served as models for such masters of the landscape asJohn Constable and William Turner. Features creativity of Thomas Gainsborough. 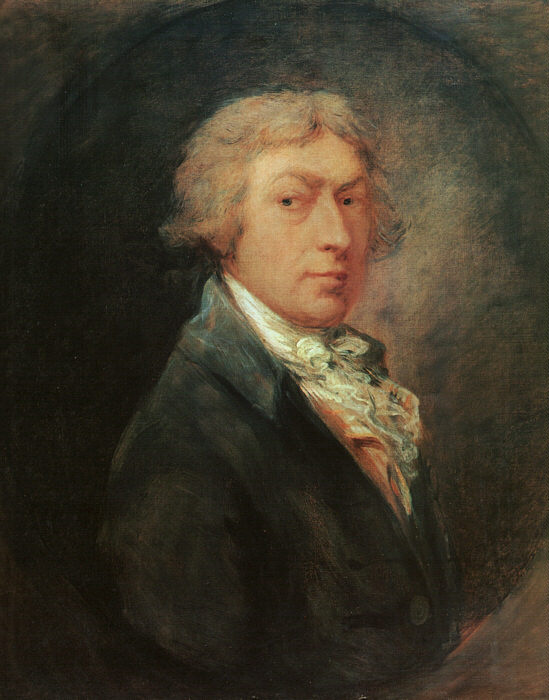 Of all the English artists of the eighteenth century, Thomas Gainsborough was the most resourceful and original, always ready to experiment with new ideas and techniques. However, he still complained about his rival, sir Joshua reynolds: "Damn it, how varied is it!". Despite his tremendous success as a portrait painter, Gainsborough favored landscapes, although they were unpopular with the public at that time. Unlike Reynolds, he was not a big supporter of academic tradition and mocked the fashion for historical painting. Art critic Mary Woodall called him "An intuitive artist who admired the poetry of colors". 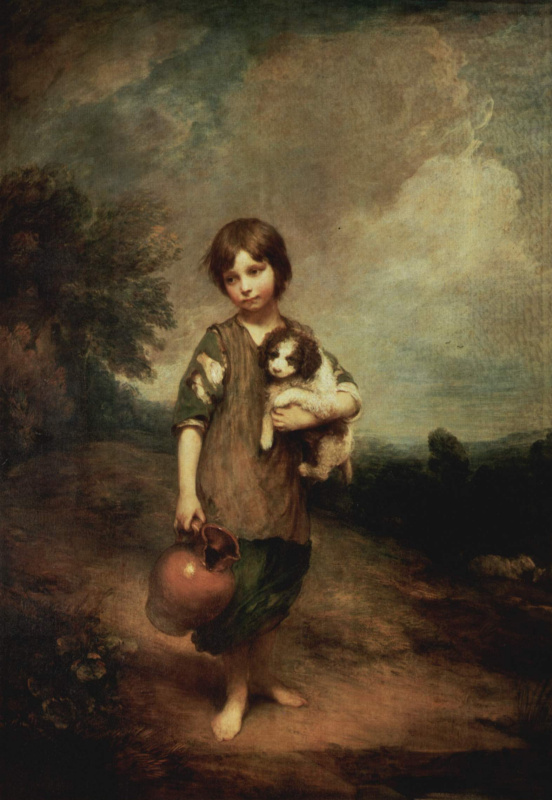 Famous paintings by Thomas Gainsborough. "The boy in the blue", "Portrait of a Lady in Blue", "Morning walk", "Portrait of the Andrews couple", "Portrait of actress Sarah Siddons". Thomas Gainsborough began drawingstill in childhood and at age 13 persuaded his father to send him to study in London. Have a ruined merchant wool and a large parentJohn Gainsborough It is unlikely that there would be money for training a son if it were not for the tragedy in the family. His brother and nephew were killed in undisclosed circumstances, leaving a decent inheritance to their relatives. Uncle Thomas Gainsborough (also, by the way, Thomas) bequeathed £ 40 so that the boy would find a "light craft". It is this money as Mark Bills writes, director of the House of Gainsborough in Sudbury, allowed the family in 1740 to send a teenager to London to study for engraver Uber Francois Gravelo. This Frenchman at that time was an important figure in the artistic circles of London. He gave the student knowledge of the Rococo style, which had a significant influence on the formation of the artistic manner of Gainsborough. In 1746, a 19-year-old youth married Margaret Burr, illegitimate daughter of the Duke of Beaufort, who received an annual content of 200 pounds. Shortly after, the couple moved to Suffolk and settled in Ipswich in 1952. with two daughters. There, Gainsborough gained a reputation as a good portrait painter and landscape painter, which allowed him to support his family. By and large, Gainsborough was self-taught and the art of his beloved landscape painting was comprehended through the paintings of the seventeenth-century Dutch, who by 1740 had become popular with English collectors. His initial work shows a strong influence. Jan Vaynantsa. For example, in the first dated picture of the landscape —"Bull Terrier in the background of the landscape" (1745) — many elements are taken directly from the compositions of this Dutch painter. But already in 1748, during the creation "Kornard Forest", his main "mentor" became Jacob van Roysdal. Although this view is full of naturalistic details, the author seems to have never worked directly on nature. "If Gainsborough planned to paint the landscape, he constructed a landscape model right in his workshop […] Any available materials: twigs, pebbles, sand"— read the article "Arthive" "Unexpected Thomas Gainsborough. 7 stories about the hobbies of the artist ". 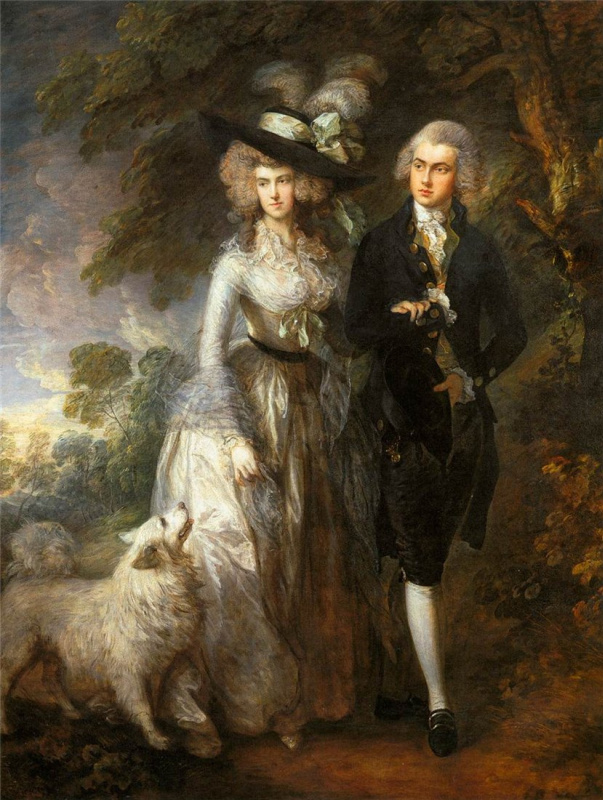 However, in "The Portrait of the Andrews Couple", written just a year after the "Bull Terrier", Gainsborough shows his own style and at the same time anticipates the realism of the great landscape painter of the next century, John Constable. This work is called "Most English of all English paintings"and the landscape on it is a typical view of Suffolk. Although Gainsborough preferred landscapes, he understood that for financial reasons he had to paint portraits. In his native county, he made several full-length images, albeit rather stiff, but surprisingly fully revealing the characters of the models. Among them stands separately"Portrait of William Wallace" — both pretentious in composition and informal in spirit. A simple naturalism and benevolence "Daughters of the artist, running after the butterfly"created in recent years of residence in Ipswich, make this picture one of the best English children’s portraits. In pursuit of orders, Gainsborough moved to the resort town of Bath in 1759, and soon fashionable visitors filled his studio. The artist, who played well on many instruments, quickly became known in musical and theatrical circles. He also entered many rich houses, where he became acquainted with the paintings.Anthony van Dyck and fell under their charm. The dominant influence of the Flemish master became noticeable in the second half of Gainsborough’s career. In 1761, the painter sent"Portrait of Count Nugent" the Society of Artists, and the following year in the London press appeared the first message about his work. 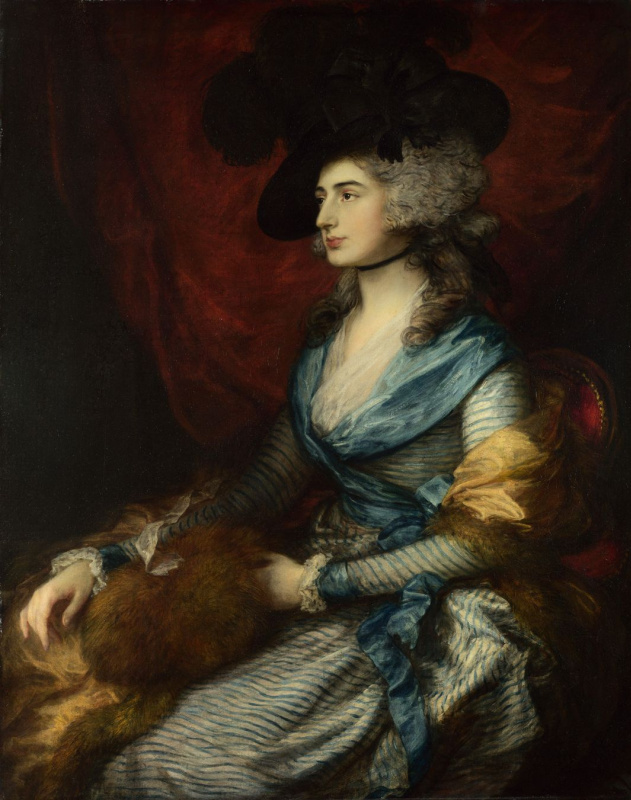 During the 1760s, Gainsborough was regularly exhibited in London, and in 1768 he became one of the founders of the Royal Academy of Arts. But it is interesting that he never took an active part in the meetings. After moving to Bath, the artist had little time for landscapes, and he worked a lot from memory, often drawing landscapes by candlelight from "desktop models." Since about 1760, Gainsborough became the "chief mentor" Peter Paul Rubens. This is especially noticeable in the richness of color and beautiful cream pastel shades in the picture. "The return of peasants from the market"as well as in "Harvest on the wagon". Here it manifests itself in the smoothness of the pattern and the scale of large beech trees, so different from the squat oaks of Suffolk. This idyllic scene is the perfect combination of reality and imagination. The characters became the prototypes of the figures on the cart"Rising from the Cross" (1611 — 1614) Rubens, which Gainsborough copied in the Cathedral of Antwerp. In Bath, Gainsborough had to satisfy a more sophisticated clientele and adopt a more formal and elegant style of portraits. His help wascollective image of the family of Count Pembroke brush Van Dyck, which he copied in the family estate of aristocrats in Wilton. 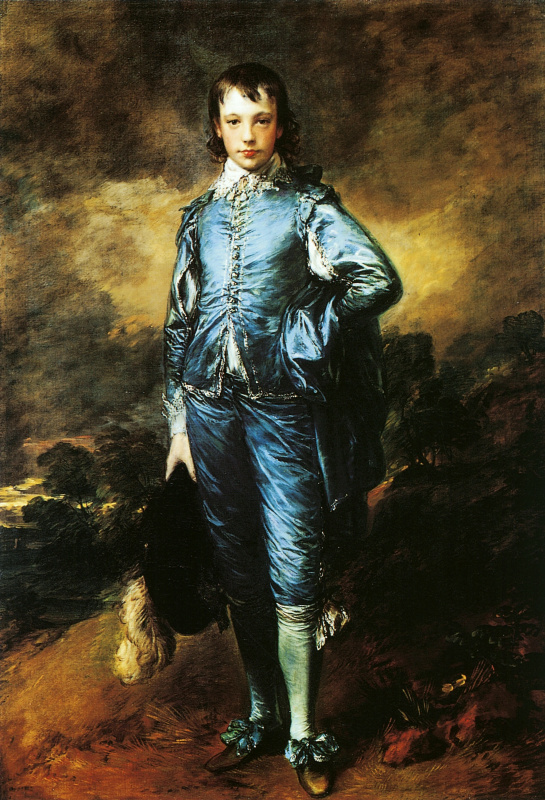 Perhaps the most famous painting by Gainsborough, The Blue Boy, was probably painted in 1770. While portraying a young man in a Van Dyck costume, the artist followed the fashion of his time and at the same time paid tribute to his idol. Van Dyck’s influence is clearly seen in works such as"Portrait of John Campbell, 4th Duke of Argyll" and "Portrait of Commander Augustus Hervey"competing with the works of Reynolds. Gainsborough preferred to paint friends rather than public figures, and a number of portraits of the 1760s demonstrate the artist’s sense of humor and his sympathy for models. In 1774, Gainsborough moved to London, where he was soon noticed by a crowned family. King George III preferred it to official court painter Sir Joshua Reynolds and in 1781 orderedwrite yourself and your spouse.Portrait of Queen Charlotte — One of the few in the works of the artist, where there is a curtain in the background. Unlike his contemporaries, Gainsborough did not like draperies. Earning money with portraits, the artist did not refuse landscapes. In 1783, he made an expedition to the Lake District to personally see the picturesque "wild" places, praised by enthusiasts. 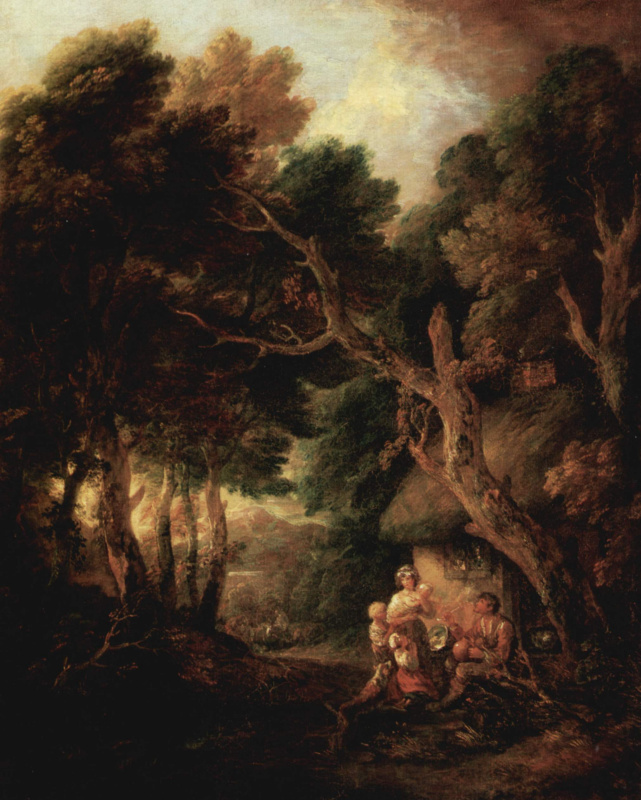 Upon his return, Gainsborough wrote several mountain views in which there are analogies with the works Gaspara Dughetwhich were widespread on English estates. In the final years, when Gainsborough pursued nostalgia for "good old England", he wrote a series of paintings from peasant life, idyllic rather than real, for example, "Cottage Doors". At the same time one of the last landscapes, "Trip to the market", less idealized and more naturalistic. Considering in it the light breaking through the massive foliage, the artist anticipates the work of John Constable. Gainsborough was the only major English portraitist who devoted a lot of time to landscape sketches. He made a large number of drawings in chalk, pen, watercolor (1, 2), always sought to find new paper and new methods. The painter never sold such etudes and, although many of them are closely related to the paintings, these are not sketches in the usual sense, but works of art in themselves. In 1784, Gainsborough quarreled with academicians who insisted that the portrait"Three senior princesses" should hang at a normal height from the floor. The author himself believed that it was too high and did not allow him to appreciate the ease of the stroke and the subtlety of the pattern. In protest, he took off all the paintings that he intended to exhibit, and never showed them at the Academy. Thomas Gainsborough died of cancer on August 2, 1788, at the age of 61. According to his will, he was buried on the territory of St. Anne’s Church in London’s Kew District, famous for its lush and varied landscape. This turned out to be the most suitable place for an artist who loved landscapes and became famous for his elegant brush strokes and extraordinary sense of light. After the death of Gainsborough, his eternal rival Joshua Reynolds dedicated a colleague of his annual lecture to students and members of the Royal Academy. He admitted that "All these strange scratches and dots … at a certain distance, due to some magic, take shape, and all the parts seem to fall into place". However, it was Reynolds and the standards he prescribed for the Royal Academy that diminished the post-mortem reputation of Gainsborough. The sales results after his death were disappointing, and the publication of a series of engravings was a failure. Although the painter was later named one of the founders of the English landscape school, a major retrospective at the British Institute in 1814 corrected little in this situation. The popularity of Gainsborough and the new recognition of his merits were largely due to the National Gallery in London, which acquired it in 1827 and 1830. "Watering" and "Trip to the market." In his lecture at the British Institute on June 16, 1836, John Constable paid tribute to his predecessor in the most touching words: "The landscapes of Gainsborough are soothing, gentle and exciting. The silence of the afternoon, the twilight depth, the pearly purity of the morning dew — everything can be found on the canvases of this most benevolent and good-hearted person. When looking at them, we have tears in our eyes, and we do not know what causes them. ". There are axioms significant for the biography of Thomas Gainsborough. For example, this: the XVIII century, the heyday of English painting, produced three great ones. Of them Hogarth — realist and "bytovik", Constable — landscape painter, and Gainsborough — portrait painter par excellence. It’s like that. But Gainsborough himself said that "there is no devilry worse than writing portraits," he is "sick" of them and sometimes he is "ready to cut his throat with a knife to clean the palette". The portraits sold well and were exhibited, the landscapes were of little interest to anyone. But it was the landscape of Gainsborough that he considered his real vocation. Any official biography of Thomas Gainsborough will tell his father was a cloth merchant. There is a delicate nuance: in the town of Sudbury in eastern Britain, John Gainsborough had a monopoly on sewing shrouds. He loved his business, he even went to exchange experiences in France and Holland, and once on a moonlit night, crossing the border, scared the customs officer to death, when in response to a request to present his goods he wrapped himself in a shroud. In the middle of the XVII century. Parliament passed a law ordering to sew savana only from English wool, so that John and his wife Susanna were doing well, the family grew. Thomas was their youngest, ninth, child. But whether the Sudbury residents suddenly changed their mind about dying, or the situation changed: when Thomas was six, the family went bankrupt and did not remain on the street only thanks to a kind relative who bought their house at the auction. Not everyone with honor will carry poverty after years of prosperity. But not the Gainsborough family! All the children in it were distinguished by intelligence and wit. The eldest, Jack, designed the eternal charge for the cuckoo clock, the self-swaying cradle, and then, like Icarus, tried to fly on the wings of copper. The more practical Humphrey received an award for improving the steam engine. Thomas, on the whole, was busy with inventing a plausible excuse for the teacher to let him go from his lessons. In the picturesque surroundings of Sudbury, he spent whole hours sketching hills and valleys, as well as horses, cows, dogs and sheep. They joked that there was not a single group of trees and shrubs in the district that Gainsborough could not reproduce from memory. His younger contemporary and compatriot, the great landscape painter Constable, will say: "In Sudbury, I see Gainsborough in any hollow tree and in every hedge". Gainsborough left home very early — at age 13. And from that time on, the sale of small etudes provided himself. He married too early — at 18. Margaret, his wife, was the illegitimate daughter of the duke de Beaufort, and the 200-pound annual rent, which her father had laid, rescued Gainsborough’s family more than once, when orders were very tight. By the nature of his talent, Gainsborough can be called a nugget: he never received a systematic art education, although he did not study much in London with the French draftsman Hubert Gravelot. The latter is known for instilling rococo style on English soil. His student Gainsborough, who became one of England’s virtuoso draftsmen, will be dominated by curvilinear rhythms typical of Rococo. Around 1750, Thomas and Margaret move to the town of Ipswich. They already have a daughter, Mary, and soon the second one will be born — also Margaret, like a mother. A series of paired portraits of the artist’s daughters, made with great skill and spontaneity, is the best Gainsborough in Ipswich, and, according to many, the best children’s portraits in British painting. The family moves to Bath, a fashionable aristocratic resort in search of a living. Sociable and musical Gainsborough quickly finds friends among actors, musicians, patrons of art, and idle and wealthy holidaymakers gladly order him portraits. There is a story about how a noble customer, in adopting a pictorial pose in an armchair, demanded that Gainsborough not forget to capture the thoroughbred dimple on his chin. To this, the artist replied that he did not intend to depict "neither a nasty dimple, nor the whole bloody chin." In Bath, in addition to a large number of useful acquaintances, Gainsborough happens and the most important meeting of a different order — familiarity with creativity Van dyck and late landscapes Rubens. 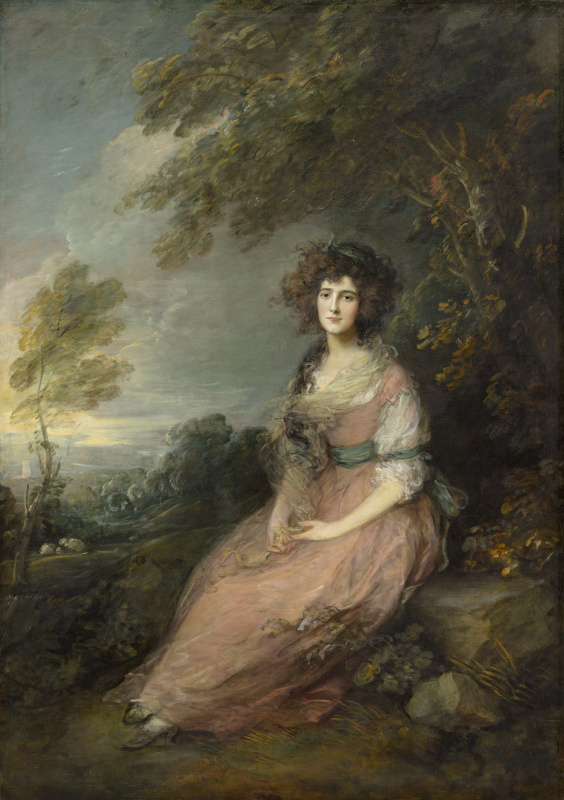 Art critics find that they have fundamentally transformed the work of the already mature Gainsborough. Gainsborough’s relocation to London in the mid-1770s is linked to membership in the Royal Academy of Arts. But in 1784 the artist with the scandal will leave her. The cause will be latent rivalry with Joshua reynolds, a portrait painter, theorist and founder of the Academy, the reason is that the pictures for the exhibition were hung slightly higher than what Gainsborough requested. The easiest way to call it unfounded vagaries. But in the memoirs of all who knew him, the artist remained a modest and tactful man. Obviously, for Gainsborough, the question of the context in which his canvases are placed is extremely important. "I would be glad— he turned to customers — if you hung a picture so the light would fall to the left …"Gainsborough always started working in a darkened room, so that the details did not distract from the composition, and as the canvas was ready, he let in more and more light into the workshop. That light will be the main "know-how" of Gainsborough. His landscapes and portraits, organically inscribed in the landscape (and this is the second "know-how" of Gainsborough — the landscape that plays into the mood of the person being portrayed), are permeated with a special, purely English sense of light, fusing things in a magic whole. By the age of 60, Gainsborough had finally reached popularity: not only portraits, but also landscapes, and even rural things, which he wrote with pleasant nostalgia for his childhood in Sudbury, began to be sold for very good money. However, at that time they still cost less than the classicist Reynolds. In 1787, the year of Gainsborough, unexpectedly for all, predicted his imminent death. Having met the playwright Sheridan, the author of "The School of Slander" (Gainsborough wrote his lovely spouse more than once), the artist said: "I have many friends, but so few friends. I look completely healthy, but I feel that I will die soon. I want so much for a decent man to go behind the coffin. Promise that it will be you! " Sheridan could not refuse. Less than a year later, Gainsborough died of cancer. Before his death, he was visited by an eternal rival and opponent Reynolds, and the last words of Gainsborough were "We will all be in heaven — and Van Dyke is with us.". 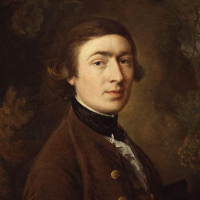 Thomas Gainsborough (Thomas Gainsborough, baptized on May 14, 1727, Sudbury, Suffolk County - August 2, 1788, London) - painter and engraver, one of the most prominent and versatile English artists of the XVIII century. Famous for its exquisite portraits and idyllic landscapes that served as models for such masters of the landscape asJohn Constable and William Turner. Features creativity of Thomas Gainsborough. 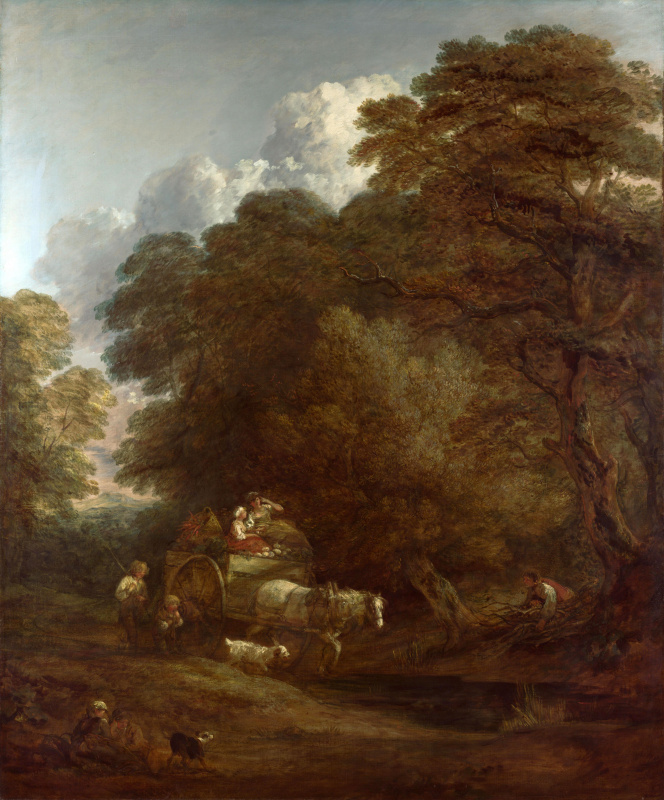 Of all the English artists of the eighteenth century, Thomas Gainsborough was the most resourceful and original, always ready to experiment with new ideas and techniques. However, he still complained about his rival, sir Joshua reynolds: “Damn it, how varied is it!”. Despite his tremendous success as a portrait painter, Gainsborough favored landscapes, although they were unpopular with the public at that time. Unlike Reynolds, he was not a big supporter of academic tradition and mocked the fashion for historical painting. Art critic Mary Woodall called him "An intuitive artist who admired the poetry of colors". Thomas Gainsborough began drawingstill in childhood and at age 13 persuaded his father to send him to study in London. Have a ruined merchant wool and a large parentJohn Gainsborough It is unlikely that there would be money for training a son if it were not for the tragedy in the family. His brother and nephew were killed in undisclosed circumstances, leaving a decent inheritance to their relatives. Uncle Thomas Gainsborough (also, by the way, Thomas) bequeathed £ 40 so that the boy would find a “light craft”. It is this money as Mark Bills writes, director of the House of Gainsborough in Sudbury, allowed the family in 1740 to send a teenager to London to study for engraver Uber Francois Gravelo. By and large, Gainsborough was self-taught and the art of his beloved landscape painting was comprehended through the paintings of the seventeenth-century Dutch, who by 1740 had become popular with English collectors. His initial work shows a strong influence. Jan Vaynantsa. For example, in the first dated picture of the landscape -"Bull Terrier in the background of the landscape" (1745) - many elements are taken directly from the compositions of this Dutch painter. But already in 1748, during the creation "Kornard Forest", his main "mentor" became Jacob van Roysdal. Although this view is full of naturalistic details, the author seems to have never worked directly on nature. “If Gainsborough planned to paint the landscape, he constructed a landscape model right in his workshop [...] Any available materials: twigs, pebbles, sand”- read the article "Arthive" “Unexpected Thomas Gainsborough. 7 stories about the hobbies of the artist ". However, in “The Portrait of the Andrews Couple”, written just a year after the “Bull Terrier”, Gainsborough shows his own style and at the same time anticipates the realism of the great landscape painter of the next century, John Constable. This work is called "Most English of all English paintings"and the landscape on it is a typical view of Suffolk. Although Gainsborough preferred landscapes, he understood that for financial reasons he had to paint portraits. In his native county, he made several full-length images, albeit rather stiff, but surprisingly fully revealing the characters of the models. Among them stands separately"Portrait of William Wallace" - both pretentious in composition and informal in spirit. A simple naturalism and benevolence "Daughters of the artist, running after the butterfly"created in recent years of residence in Ipswich, make this picture one of the best English children's portraits. After moving to Bath, the artist had little time for landscapes, and he worked a lot from memory, often drawing landscapes by candlelight from "desktop models." Since about 1760, Gainsborough became the “chief mentor” Peter Paul Rubens. This is especially noticeable in the richness of color and beautiful cream pastel shades in the picture. "The return of peasants from the market"as well as in "Harvest on the wagon". Here it manifests itself in the smoothness of the pattern and the scale of large beech trees, so different from the squat oaks of Suffolk. This idyllic scene is the perfect combination of reality and imagination. The characters became the prototypes of the figures on the cart"Rising from the Cross" (1611 - 1614) Rubens, which Gainsborough copied in the Cathedral of Antwerp. Van Dyck’s influence is clearly seen in works such as"Portrait of John Campbell, 4th Duke of Argyll" and "Portrait of Commander Augustus Hervey"competing with the works of Reynolds. Gainsborough preferred to paint friends rather than public figures, and a number of portraits of the 1760s demonstrate the artist's sense of humor and his sympathy for models. In 1774, Gainsborough moved to London, where he was soon noticed by a crowned family. King George III preferred it to official court painter Sir Joshua Reynolds and in 1781 orderedwrite yourself and your spouse.Portrait of Queen Charlotte - One of the few in the works of the artist, where there is a curtain in the background. Unlike his contemporaries, Gainsborough did not like draperies. In the final years, when Gainsborough pursued nostalgia for “good old England”, he wrote a series of paintings from peasant life, idyllic rather than real, for example, "Cottage Doors". At the same time one of the last landscapes, "Trip to the market", less idealized and more naturalistic. Considering in it the light breaking through the massive foliage, the artist anticipates the work of John Constable. After the death of Gainsborough, his eternal rival Joshua Reynolds dedicated a colleague of his annual lecture to students and members of the Royal Academy. He admitted that "All these strange scratches and dots ... at a certain distance, due to some magic, take shape, and all the parts seem to fall into place". In his lecture at the British Institute on June 16, 1836, John Constable paid tribute to his predecessor in the most touching words: “The landscapes of Gainsborough are soothing, gentle and exciting. The silence of the afternoon, the twilight depth, the pearly purity of the morning dew — everything can be found on the canvases of this most benevolent and good-hearted person. When looking at them, we have tears in our eyes, and we do not know what causes them. ”. There are axioms significant for the biography of Thomas Gainsborough. For example, this: the XVIII century, the heyday of English painting, produced three great ones. Of them Hogarth - realist and "bytovik", Constable - landscape painter, and Gainsborough - portrait painter par excellence. It's like that. But Gainsborough himself said that “there is no devilry worse than writing portraits,” he is “sick” of them and sometimes he is “ready to cut his throat with a knife to clean the palette”. The portraits sold well and were exhibited, the landscapes were of little interest to anyone. But it was the landscape of Gainsborough that he considered his real vocation. Not everyone with honor will carry poverty after years of prosperity. But not the Gainsborough family! All the children in it were distinguished by intelligence and wit. The eldest, Jack, designed the eternal charge for the cuckoo clock, the self-swaying cradle, and then, like Icarus, tried to fly on the wings of copper. The more practical Humphrey received an award for improving the steam engine. Thomas, on the whole, was busy with inventing a plausible excuse for the teacher to let him go from his lessons. In the picturesque surroundings of Sudbury, he spent whole hours sketching hills and valleys, as well as horses, cows, dogs and sheep. They joked that there was not a single group of trees and shrubs in the district that Gainsborough could not reproduce from memory. His younger contemporary and compatriot, the great landscape painter Constable, will say: “In Sudbury, I see Gainsborough in any hollow tree and in every hedge”. Gainsborough left home very early - at age 13. And from that time on, the sale of small etudes provided himself. He married too early - at 18. 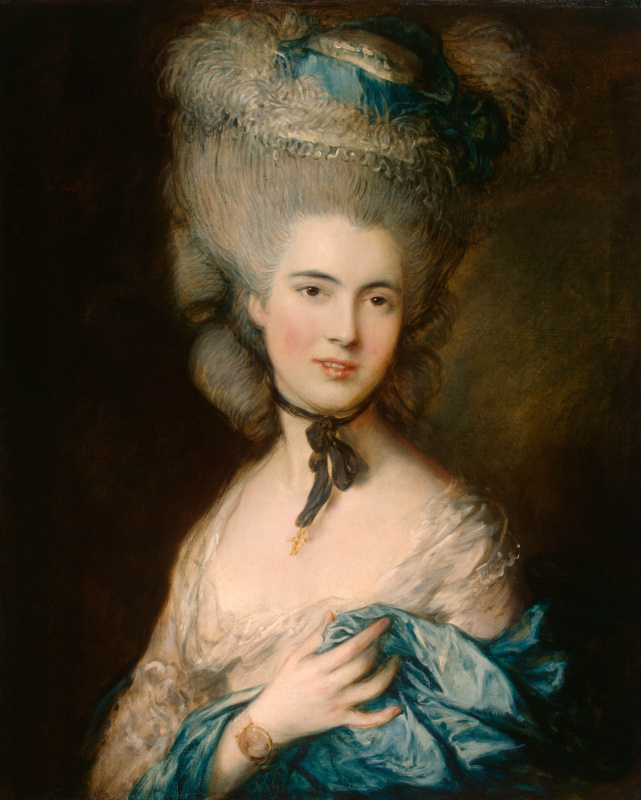 Margaret, his wife, was the illegitimate daughter of the duke de Beaufort, and the 200-pound annual rent, which her father had laid, rescued Gainsborough's family more than once, when orders were very tight. Around 1750, Thomas and Margaret move to the town of Ipswich. They already have a daughter, Mary, and soon the second one will be born - also Margaret, like a mother. A series of paired portraits of the artist’s daughters, made with great skill and spontaneity, is the best Gainsborough in Ipswich, and, according to many, the best children's portraits in British painting. In Bath, in addition to a large number of useful acquaintances, Gainsborough happens and the most important meeting of a different order - familiarity with creativity Van dyck and late landscapes Rubens. Art critics find that they have fundamentally transformed the work of the already mature Gainsborough. Gainsborough’s relocation to London in the mid-1770s is linked to membership in the Royal Academy of Arts. But in 1784 the artist with the scandal will leave her. The cause will be latent rivalry with Joshua reynolds, a portrait painter, theorist and founder of the Academy, the reason is that the pictures for the exhibition were hung slightly higher than what Gainsborough requested. The easiest way to call it unfounded vagaries. But in the memoirs of all who knew him, the artist remained a modest and tactful man. Obviously, for Gainsborough, the question of the context in which his canvases are placed is extremely important. "I would be glad- he turned to customers - if you hung a picture so the light would fall to the left ...»Gainsborough always started working in a darkened room, so that the details did not distract from the composition, and as the canvas was ready, he let in more and more light into the workshop. That light will be the main "know-how" of Gainsborough. His landscapes and portraits, organically inscribed in the landscape (and this is the second “know-how” of Gainsborough - the landscape that plays into the mood of the person being portrayed), are permeated with a special, purely English sense of light, fusing things in a magic whole. In 1787, the year of Gainsborough, unexpectedly for all, predicted his imminent death. Having met the playwright Sheridan, the author of “The School of Slander” (Gainsborough wrote his lovely spouse more than once), the artist said: “I have many friends, but so few friends. I look completely healthy, but I feel that I will die soon. I want so much for a decent man to go behind the coffin. Promise that it will be you! ” Sheridan could not refuse. Less than a year later, Gainsborough died of cancer. Before his death, he was visited by an eternal rival and opponent Reynolds, and the last words of Gainsborough were "We will all be in heaven - and Van Dyke is with us. ".